Every now and then I receive emails from people who generously share their IELTS preparation advice. Today I would like to offer you the opportunity to learn from Ayan’s experience – here is his IELTS preparation story that lead to Band 7 in the real exam. “It was the beginning of the February when I took IELTS exam and now, when I know my results, I want to share the way I practiced and the tips I suppose would be very fruitful for you. The first and, in my opinion, the most significant thing everyone has to bear in mind is that this website ielts-blog.com has heaps of truly useful knowledge and experiences shared by IELTS-takers. Thereby, you have to utilize this site wisely. Surely, I appreciate this website and I am very pleased now to thank the staff working there and you, Simone. The second important trait of the preparation is having a plan, a very explicit one that you follow. I must tell you that whether you prepare with a particular tutor or prepare by yourself, you are to be very wise when trying to plan the curriculum. This is my utmost will to compel students to have a perfectly elaborated way they will go. 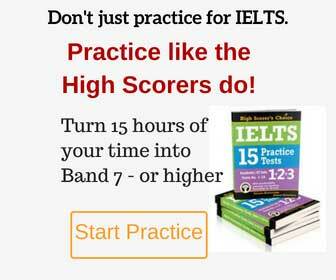 Thirdly all of you must obtain the book, which is, by the way, very popular IELTS Target Band 7. Many of you may mistakenly think this book can only help you gain Band 7 or less, however, I must gladden you – this is a very popular delusion. This book can assist you to achieve more than even Band 8, I mean, you can get the perfect result – Band 9. Fourthly, you are to know that the more you practice by yourself, the better your score is. I know that self-practice can allow you to have more than with the help of the tutor you have. Thus, do not even pretend you cannot, you surely can if you want to! The fifth, very crucial, thing you also have to be cognizant of – have an aim! Target yourself to have a preferable score! Be as much stubborn and placid as it is possible, as it’ll lead you to your goal. Writing – you have to understand the structure firstly, and then you have only to have a great amount of practicing. This is not the most difficult part of the IELTS, just pace and time yourself ever when preparing. Make sure you’ve read and written at least 20 prefect essays. IELTS-blog.com will be very helpful when searching for essays. I’ve got 7.0 here. Reading was the most complex skill for me. I’ve, unfortunately, got only 6.5 here. But do not think this is hard and the way you will be practicing in has to be very convoluted, you only should know that the book ‘IELTS Target band 7’ will be very important here and you have to practice the techniques given there. Speaking – be careful! I have been practicing only for one day on speaking, as I thought it was the easiest part, yet my score here is 7.0 and I could get more. I want all of you to have a lot of practicing. Listening – my score is 7.5 in the listening section. I’ve only done 2 practice tests. You firstly need to take the practice tests, secondly – check you results and, ultimately, listen to a tape again and simultaneously read the transcripts given on the last pages of all the IELTS practice tests.